(P1) Venezuela said it will issue higher-denominated bills as triple-digit inflation and a currency meltdown leaves the country’s largest banknote worth just around 2 US cents on the black market. The central bank said Saturday that six new bills ranging from 500 to 20,000 Bolivars will begin circulating on Dec. 15, reports the AP. Currently, the largest denominated bill is 100 bolivars, while a 2-liter soft drink bottle can cost 25 times that. 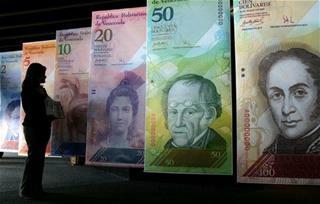 The new bills come as Venezuela is bordering on economic collapse. The currency lost 67% of its value on the black market last month, falling to 4,587 bolivars per US dollar, the steepest monthly plunge ever, according to Dolar Today, which tracks the black market rate by monitoring transactions with the currency at foreign exchange houses across the border in Colombia. (P2) Inflation, meanwhile, is expected to surpass four digits next year, per the IMF. Cash has become impossible to find with ATM withdrawals capped at an extremely low amount and Friday the nation’s credit card system froze for hours. President Nicolas Maduro blamed a “cyber attack” and ordered the Sebin intel service to raid CrediCard, which processes payment for Visa and MasterCard. He’s also accused “mafias” in neighboring Colombia of trying to carry out an “economic coup” against his socialist-run economy. “The right wing wants to impose on Venezuela a parallel exchange rate from an account in Miami, and from that account take the dollar to a disastrously crazy level,” Maduro said. Venezuela has maintained strict currency controls since 2003 and currently has two legal exchange rates of 10 and 663 bolivars per dollar used for priority imports. On the black market, where people turn when they can’t obtain government approval to purchase dollars at legal rates, the bolivar has collapsed by a factor of five in the past year. What is the cost of living like in your country? Are there caps on the amount of money you can withdraw from an ATM in your country? If so, what’s the max amount you can withdraw? How much is the largest paper bill worth in Venezuela’s black market? What’s the amount of the highest new banknote that is being released in Venezuela? The leader of Venezuela is __________________. Who’s being blamed for an economic coup in Venezuela? What is the name of the currency in Venezuela?